If contemporary biometric technology is defined by its ability to collect information about a body’s biological functioning, and transmit this information to a central location for collection and analysis, then this telemetric system can be regarded as a pioneer in the field. Developed in the 1960s by scientists at the National Research Council of Canada, it was used to study a pigeon’s heart rate, wing movement, and breathing during flight. 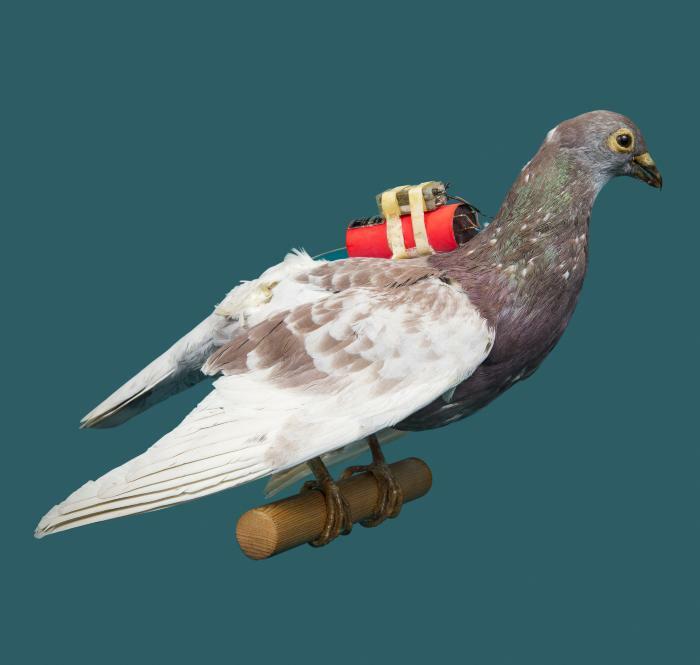 Pictured here is the telemetric “backpack” that collected information from three leads: one connected to the pigeon’s heart (internally), a second connected to a clip on the pigeon’s wing (not shown), and a third connected to a breathing mask over the pigeon’s beak (not shown). The backpack then transmitted this data wirelessly, via two radio carrier signals, which could be analyzed in real-time by researchers on the ground.